Make a list of the worst crimes anyone can commit and matricide has to come very near the top. Yet that’s what Britain’s Conservative Party committed a quarter of a century ago. Understanding this is the key to understanding why, this summer, the U.K.’s Conservative government is holding a referendum which could see the country bolt from the 28-member European Union. In November 1990, Margaret Thatcher had been the Conservative Party’s leader for 15 years and had never lost a general election. Indeed, as her strongest supporters never tired of pointing out, she’d won three of them on the trot since her first victory in 1979. Getting rid of the Iron Lady half way through the parliament, they argued, was madness. There must, therefore, be an ulterior motive. That motive, as they saw it, was Europe. The Tories had always been ambivalent about the U.K.’s participation in the European integration project. It was their government, reflecting centuries of British imperial thinking about not getting mired in continental affairs, which had shown no interest in joining the original six member states when they created the European Economic Community back in 1957. And although it was a Conservative government that belatedly signed the U.K. up to the project in 1973—mainly to gain greater access to growing European markets—many MPs and activists remained unconvinced. To them, the economic gains could never compensate for the inevitable sacrifice of the country’s sovereignty and the loss of its cultural identity as an English-speaking island nation. Thatcher became leader of the Conservative Party two years after the U.K. joined the EEC, in 1975—a year in which the country held its first referendum on membership and one in which she played an active part in persuading the country to vote yes to Europe, believing like most of her colleagues and the vast majority of businesses (especially big businesses) that the U.K. would otherwise kiss goodbye to a continent’s worth of economic opportunities. She was a powerful advocate in part because she herself hailed from precisely the kind of provincial, “middle-England,” “Main Street” middle class which, with its belief in Britain’s innate superiority and its hatred of anything which smacked of waste, was innately suspicious of a project that involved increased cooperation with foreigners and was already a byword for boondoggles. As the U.K.’s prime minister after 1979, her initial doubts about Europe, however, seemed to be confined to what she regarded as Britain’s outsized contribution to the European Community’s budget. The result became the substantial (and symbolic) rebate which she—half Boudica, half Britannia—famously forced out of her fellow heads of government in 1984. Two years after that, however, Thatcher signed the Single European Act—a treaty which made serious moves towards a truly free market in the EC. As such, it was very much in keeping with her economic philosophy. But there was a price to pay: The U.K., like other member states, surrendered its right to veto any European legislation it didn’t like in favor of a complicated system of qualified majority voting. Perhaps not surprisingly, then, regret soon set in, particularly when it became obvious to Thatcher that other countries wanted to move much further than she was prepared to contemplate towards a federal multinational entity, complete with supposedly progressive social and labor market policies (such as the setting of maximum hours for workers). These struck Thatcher as nothing less than an attempt to reintroduce socialism into Britain by the back door. Worse, Thatcher considered these same countries’ clamor for a single currency as completely out of the question—the loss of the pound sterling would amount to a surrender, a negation of national sovereignty. It was at that point, at least according to her diehard supporters in the Conservative Party, that her less “Euroskeptic” Cabinet colleagues chose to stab her in the back. They had previously strong-armed her, despite her doubts, into locking the pound sterling into what amounted to a nascent currency union, the European Exchange Rate Mechanism (ERM); but she insisted that there was no going further. Supposedly convinced that they could no longer work with a prime minister only barely on-board and bad-mouthing her own government’s economic and foreign policy, her Cabinet colleagues took advantage of Tory MPs’ mounting panic about the party’s dire opinion poll ratings to ditch her in favor of a less fervently “Euroskeptic” leader. From that moment on, the Conservatives’ long-standing ambivalence about Europe—an ambivalence Thatcher had in some ways always embodied—became a full-blown schism. It has continued to destabilize the party since. From that moment on, the Conservatives’ long-standing ambivalence about Europe—an ambivalence Thatcher had in some ways always embodied—became a full-blown schism. It has continued to destabilize the party since. 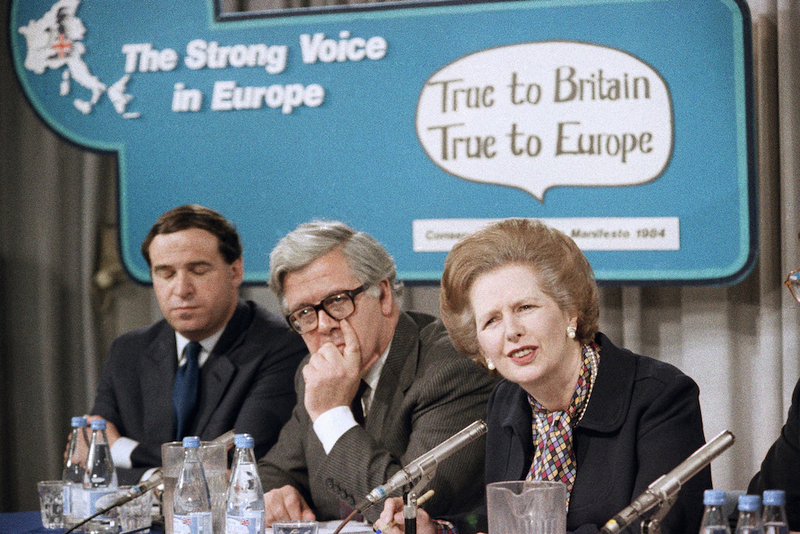 Promising to keep the country “at the very heart of Europe,” Thatcher’s less strident successor as both party leader and prime minister, John Major, helped negotiate the 1991 Maastricht Treaty which, notwithstanding the opt-out he secured allowing the U.K. to avoid signing up to the single currency, turned the European Community (EC) into the European Union (EU)—a step on the road, according to skeptics, to a “federal superstate.” Thatcher, free from the constraints of office, shared their analysis but kept her powder dry—until the 1992 general election, when Major managed to win an unprecedented fourth consecutive term for the Conservatives. That was when his luck, and her patience, finally ran out. Within months of the 1992 election, the pound sterling, which had come under pressure from speculators convinced (quite rightly) that it was overpriced relative to other currencies in the ERM, was forced out of the system, resulting in a humiliating devaluation, economic dislocation, and the sudden loss of the Tories’ lead over the opposition Labor Party. Thatcher (now in the House of Lords) then chose to make it increasingly obvious that she was deeply disappointed in her successor, and that she herself would never have signed Maastricht. Those Tory MPs who considered themselves keepers of the Thatcherite flame immediately took their icon at her word and made the Treaty’s ratification process, and many other parliamentary votes on matters European, an absolute misery for Major. After the 1997 election, during which Major’s Conservatives were roundly beaten by Labor’s Tony Blair, they needed to choose a new leader. Thatcher eventually made her support for one of several Euroskeptic candidates public, not least because she was determined, like all of her ardent fans in the parliamentary party, to do whatever she could to prevent a “Europhile” candidate carrying on from where Major left off. She, and they, got what they wanted, and although the winner, William Hague, proved a huge disappointment in electoral terms, he (and the two equally Thatcherite and equally unsuccessful Tories who succeeded him) moved the party farther and farther in a Euroskeptic direction. By the time the current Conservative leader, David Cameron, took over in 2005, the die was well and truly cast. Cameron wanted to bring the Tories back into the center ground of British politics but at the same time he needed to keep the Thatcherites on board. The obvious way to do this was to maintain the party’s antipathy towards Brussels and all its works. The party went into the 2010 election promising that any further transfer of power to Brussels would automatically trigger a referendum, and that he would see how the U.K. might “repatriate” some of the powers that had previously been transferred to the EU. Once in government after May 2010, Cameron hoped that the honoring of these promises would be enough to enable him to “turn down the volume” on Europe. How wrong he was. Appeasement rarely succeeds—as, ironically enough, Thatcher herself could have told him. Euroskeptics now made up the vast bulk of the parliamentary Conservative Party and wanted more of the kind of Brussels-bashing the Iron Lady had provided back in the day, not least because they were worried about losing support to the increasingly popular, ultra-skeptical United Kingdom Independence Party. Accordingly, a couple of months before Thatcher died in April 2013, Cameron finally promised his party and the country an in-out referendum on the U.K.’s membership in the EU. And now Cameron is stuck trying to pull off the tricky balancing act, which Thatcher only managed at the height of her powers, of being simultaneously critical and supportive of the U.K.’s membership of the EU. Thatcher, having cast her long shadow on the Tories’ handling of the European issue for decades, would doubtless have been pleased at the arrival of a milestone vote. Whether her acolytes will get the result they firmly believe she would have wanted remains to be seen. Tim Bale teaches political science at Queen Mary University of London and is the author of The Conservative Party: From Thatcher to Cameron, a new edition of which will be published later this year. *Photo by Dave Caulkin/AP photo. Brexit, Britain, EU, Europe, European Union, Margaret Thatcher, U.K.